Thank you everyone for your very kind comments on my "Happy Haunting" finish! I decided to get back out "Love and Wisdom" by The Drawn Thread. I got a few bands stitched last night. Oh it's so pretty! Love the colors. Beautiful, Nicole! Hope your DH had a good trip! It looks wonderful so far, Nicole! Very pretty colors in this piece. Nicole, what a pretty piece. I look forward to seeing more. How wonderful that your husband is home - enjoy your weekend. Very pretty---and your finish is awesome. What a fun piece. That looks very pretty, you really do stitch so fast! Enjoy having your DH home. Your current piece is pretty. I have a question... how do you keep your material from getting wrinkled? Do you iron it each time you take a snap? Your stitching always looks so neat. Glad to hear your DH is coming home and you have probably picked him up by now. very pretty Nicole! 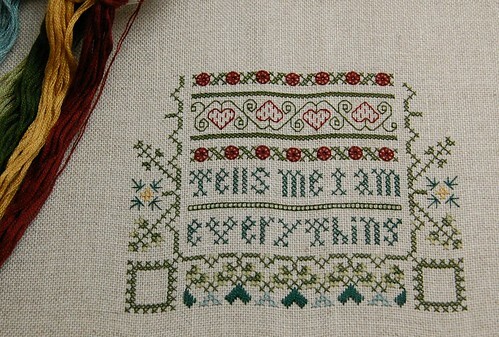 Your stitching is always so beautiful & motivational! Beautiful new start, too!! You do such lovely work. There's something about Drawn Thread patterns that 'draw' me in. Really beautiful start Nicole. Pretty piece Nicole! Glad your hubby is home. Hope you are having a great weekend! This is so pretty Nicole and your stitching is just awesome!! Went to my LNS yesterday and didn't even buy anything other than 1 skein of NPI white silk. I am anxious to see the St. Charles market things!